1337motif is Cameron Oehler – an Indianapolis-based geek and woodworker who grew up playing Nintendo and helping out in his dad’s cabinet shop. 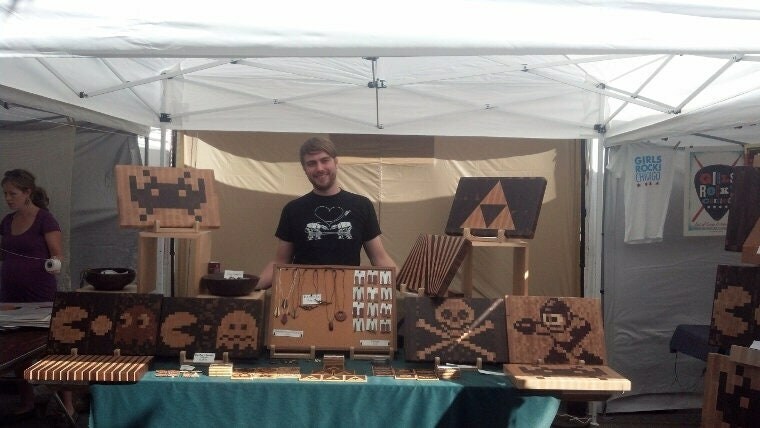 He eventually branched off to create his own work, and began doing geek-inspired woodworking in 2008 when he realized the wooden blocks that make up an end-grain cutting board could be arranged to create cool pixel-art designs. He draws inspiration for his creations from videogames, fractals, and anything else that piques his interest. His work includes end-grain cutting boards, coasters, keychains, jewelry, and more.